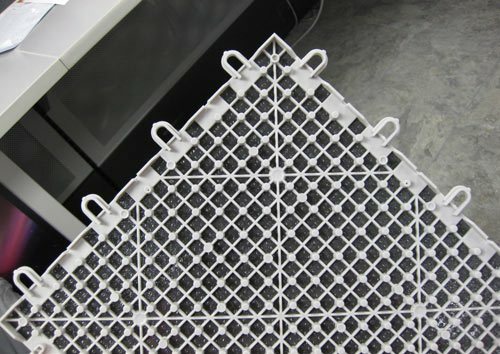 Waterproof plastic base is impervious to moisture & mold damage. Built-in drainage plane elevates carpet above a moist concrete floor. Thermal break keeps the carpet warmer than the concrete for improved comfort. 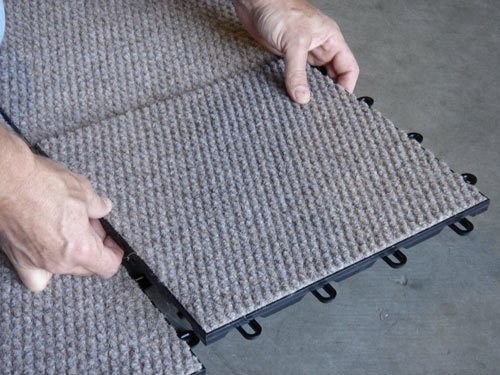 Snap-together design makes it easy to replace damaged carpeting. Speedy installation directly over concrete floor; no pad or subfloor required. 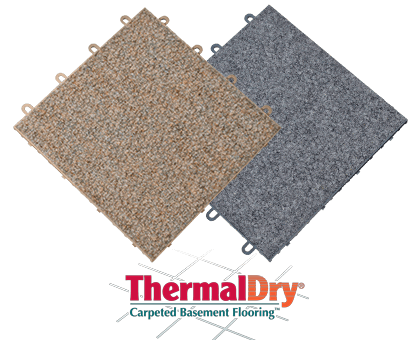 Carpet tiles can easily be combined with other types of ThermalDry® flooring (see photo below). ThermalDry® Carpet is only available from a certified installer in your area. Contact us to request an inspection & get a free cost estimate to have it installed in your home. Installation options. 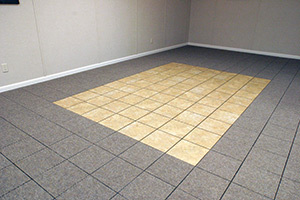 ThermalDry® flooring comes in 12-in.-square tiles that have interlocking edges. It's possible to install more that one type of ThermalDry® flooring, as shown here. In a standard basement carpeting installation, the carpet goes down over a foam pad laid directly on the concrete floor, or on a pad installed over a wood subfloor. In either case, normal basement moisture eventually causes problems with this flooring treatment. Moisture that permeates through the concrete floor is absorbed by the wood subfloor and carpeting (Moisture can also come from a plumbing leak or from ground water leakage into the basement.) These damp materials attract mold that causes bad smells and wood rot. In a short time your flooring is ruined. The product development team at Basement Systems threw out the rule book when they set out to develop basement carpeting. ThermalDry® flooring is the result of their innovative work. The family of ThermalDry® flooring tiles includes carpeted tiles as well as tiles that simulate the look of wood parquet flooring and ceramic tiles. 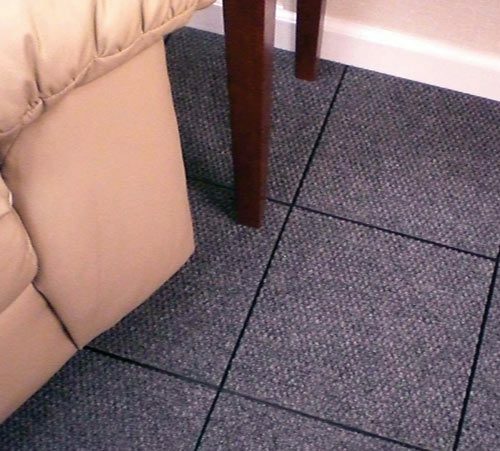 ThermalDry® carpeting doesn’t roll out over the floor; it’s manufactured in square tiles that snap together. With ThermalDry® carpet tiles, there’s no foam pad to soak up water. Instead, there’s a waterproof plastic base designed with a built-in drainage plane and thermal break. Water drains through ThermalDry® carpet rather than soaking in, eliminating worries about mold, mildew and moisture damage. The basement flooring you install will have a huge impact on your basement’s overall appearance and comfort. It makes sense to do it right the first time so that you don’t have to do it over. ThermalDry® carpet (as well as other ThermalDry® flooring) will easily outlast standard floor carpeting, and look great doing it.